Trade worries initially hit stocks on a sleepy, post-holiday Tuesday trading session. However, U.S. stocks were able to recover most of their session losses by the afternoon as investors turn their focus to the jobs report later this week. With that said, let’s look at our top trades for Wednesday. Tesla (NASDAQ:TSLA) stock faded on Tuesday, falling about 4% on reports that the automaker missed its goal to produce 6,000 Model 3s a week by the end of August, while Goldman Sachs also resumed its bearish coverage of the company. The 4% decline adds to last week’s 6.5% fall and leaves Tesla stock hovering right near last month’s lows. If this level gives way, I would expect a drop down toward the $280 level, which has been support this year. If that level fails, a retest of its lows near $250 could be in the cards. Below all three major moving averages, various trend-lines of support and the $300 to $310 range are making it hard to be bullish on Tesla right now. We need to see more constructive price action before getting long TSLA stock. 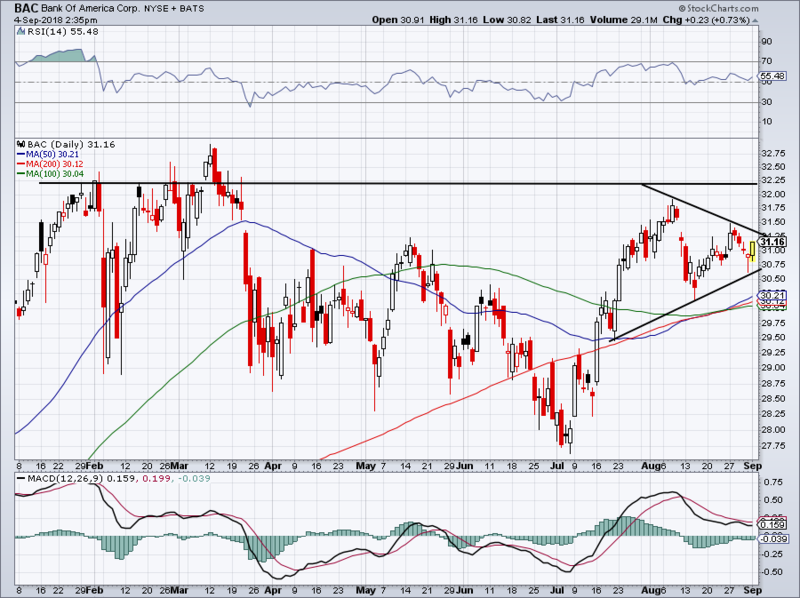 Bank of America (NYSE:BAC) was a big-time winner for us when it finally broke out over resistance in July. However, it has been struggling in August. 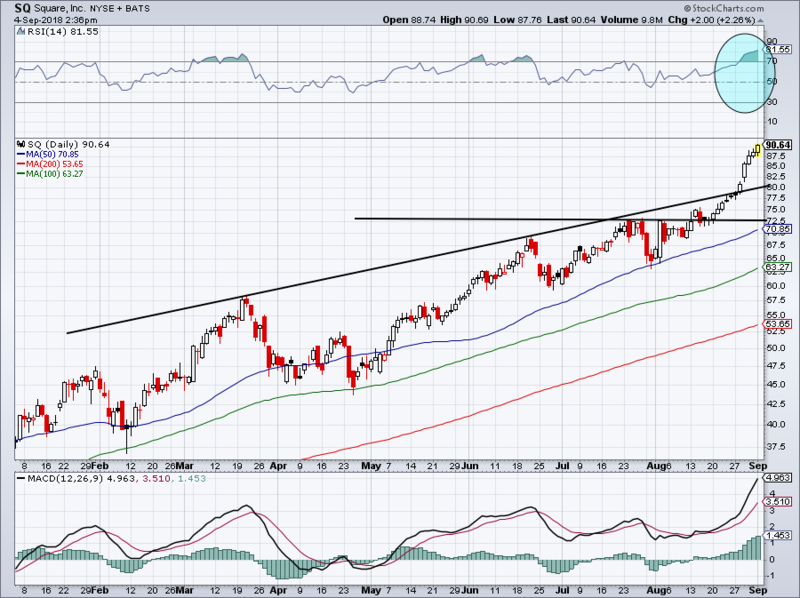 Now though, a series of higher lows and lower highs has put BAC in a tight coil. Whichever way it breaks is likely the way it will continue to go. Meaning that, over short-term resistance and BAC is likely going higher and vice versa. Should it break lower, the trio of moving averages between $30 and $30.20 should act as strong support. On the upside, recent highs near $31.75 would be target No. 1 and $32.25 would be target No. 2. Above that and the 2018 highs near $33 would be target No. 3. Nvidia (NASDAQ:NVDA) has been hot and Advanced Micro Devices (NASDAQ:AMD) has been absolutely on fire. But what about Intel (NASDAQ:INTC) stock? I would be quite leery of Intel at this point. 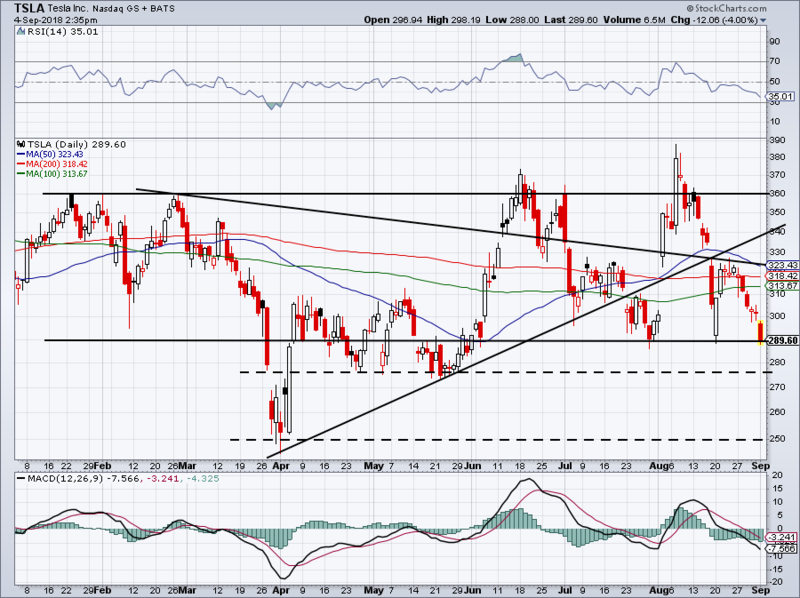 Shares are clearly trapped in a downtrend, while support near $46 to $47 continues to be tested. I warned about this a week ago and it wasn’t the first time. The more often a level is tested, the more likely it is to give way. 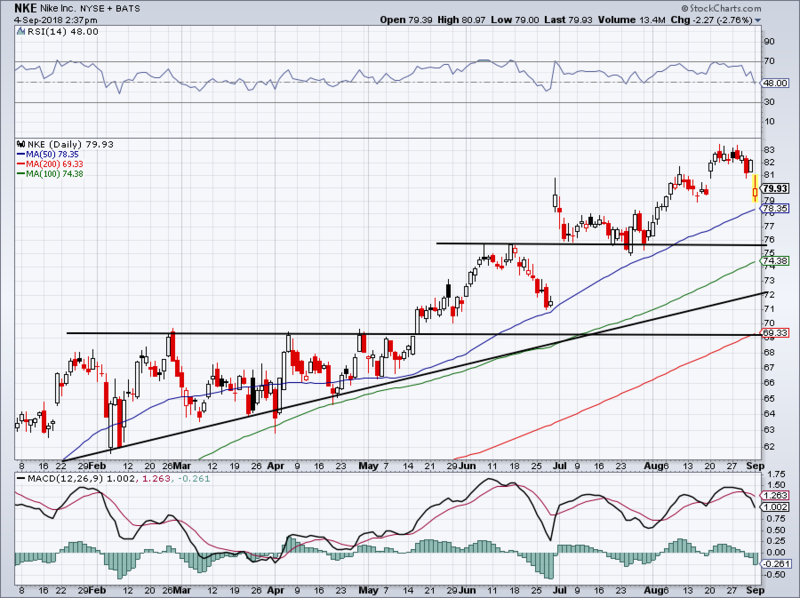 While the rest of the group churns higher, INTC continues to trade like a dog. Below all three major moving averages, we need to see shares close confidently above downtrend resistance. Otherwise a break below support is looking more likely. Following its Colin Kaepernick advertisement, shares of Nike (NYSE:NKE) took a dip, falling about 3%. The 50-day has been an excellent dip-buying level for bulls since May. Aggressive bulls can again try to go long NKE stock on that test. After all, historically speaking, Nike is a great performer in September. If the 50-day fails though, look to buy on a retest of trend-support or the 100-day moving average for more aggressive buyers. In that $75 range, NKE stock should find some buyers. If a selloff coincides with a larger market correction, we are sure-fire buyers down near $69 to $70. 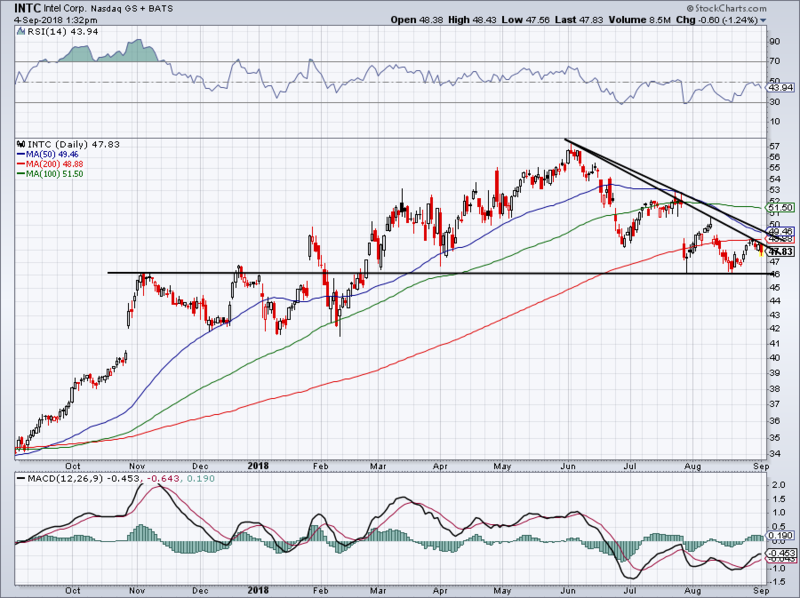 I was out on vacation last week, but before I left, wrote an article on Square (NYSE:SQ) and why it could surprise the shorts for a 10% rally to the mid-$80s. That seemed to be a non-consensus call. But sure enough, shares went right through that level, changing hands north of $91 on Tuesday. The breakout over $72.50 was big, and now nearly $20 ago. The moves in this name have been epic, as shares even pushed above channel resistance. SQ stock might want $100, but with a stretched RSI (blue circle) and after this big of a run, I wouldn’t be a buyer right now. Wait for a pullback to the backside of channel resistance. Bret Kenwell is the manager and author of Future Blue Chips and is on Twitter @BretKenwell. As of this writing, he was long BAC and NVDA. 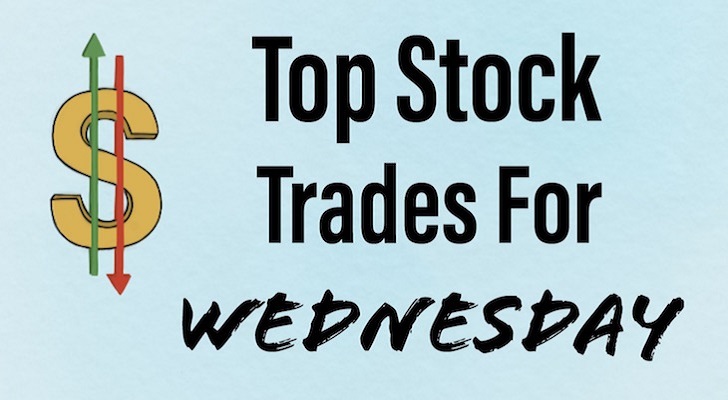 Article printed from InvestorPlace Media, https://investorplace.com/2018/09/the-5-top-trades-for-wednesday/.